Public Service Announcement: Greek fava isn't actually all that fancy. The asterisk at the bottom reveals: contains no actual fava beans. Nope. Just yellow split peas boiled down and served with raw red onion. Greeks call this fava and actual fava beans koukia. Fava is the paradosiako or traditional thing to order a meze at a classic Greek Taverna and usually served with crudely chopped red onion, which has always been a little daunting to me. Sometimes, the fava can come out almost chalky like and sometimes it's like butta. But it's even better made into a creamy hummus. Greek fava blended down with tahini and olive oil turns this simple staple into something luxurious. Plus, Greek fava is SO easy to make. I've been really into turmeric these days, so added some as well as some saffron flowers not to be confused with expensive saffron stigmas. Raw onion always throws me off kilter but not when in the form of tiny little gems on a dip with fresh mint to counterbalance. If you like hummus, I hope you try this version! 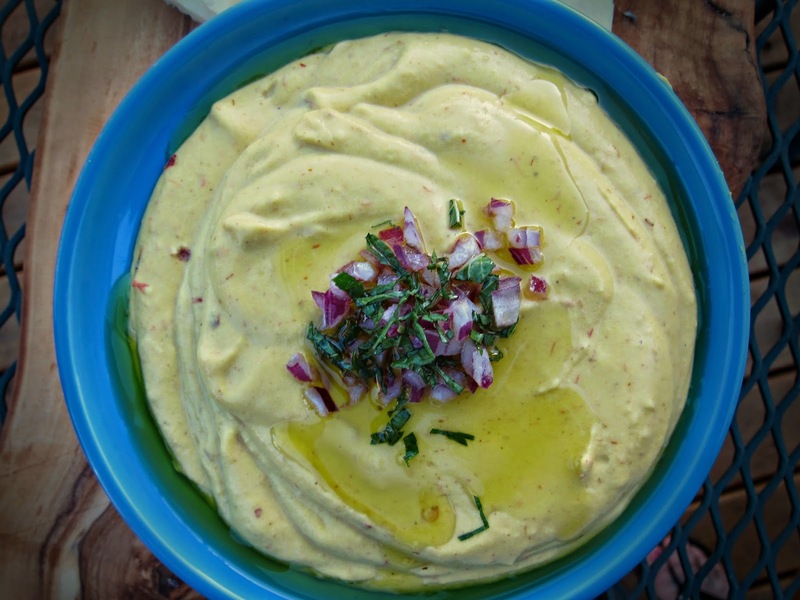 If you like Greek fava, I hope you try this hummus! In a food processor, blend all ingredients except for onions and mint until ultra smooth. Pour into a bowl, top with onions, mint and more olive oil! Greek fava sounds incredible. And I've been eating more turmeric too. Good for inflammation! Laura - Damn right it is, and it's awesomely yellow! Wow! Does that every look delicious. Both my wife and I love Greek fava dishes. This is one that we will make very soon. By the way, saffron (crocus) stamens have been an important part of Greek culture since ancient times…in food as well as art http://en.wikipedia.org/wiki/History_of_saffron). We're glad that you are posting your wonderful recipes, once again.